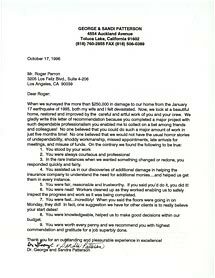 Patterson » Roger Perron Inc.
You stood by your work. You were always courteous and professional. In the rare instances when we wanted something changed or redone, you responded quickly and fairly. You assisted us in our discoveries of additional damage in helping the insurance company to understand the need for additional monies… and helped us get them in every instance. You were fair, reasonable and trustworthy. If you said you’d do it, you did it! You were neat! Workers cleaned up as they worked, enabling us to safely inspect the progress and work as it was being completed. You were fast… incredibly! When you said the floors were going in on Monday, they did! In fact, one suggestion we have for other clients is to really believe your start dates! You were knowledgeable, helped us to make good decisions within our budget. You were worth every penny and we recommend you with highest commendations and gratitude for a job superbly done. Thank you for an outstanding and pleasurable experience in excellence!